I wanted to make this journey an ATR special. 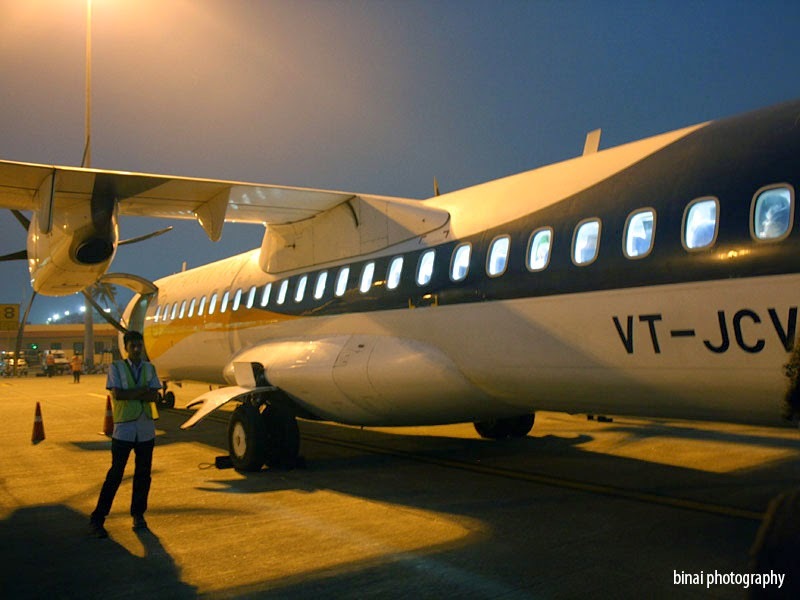 My outbound was booked two months in advance on the Air India Regional ATR42 (Read here). I hadn't booked the return ticket in anticipation of a new regional airline coming up in the South - but as the date came closer, there was no sign of the new airline taking off, and I got on to hunt for my return ticket. I wasn't shocked or astonished to see that the sector leader, Jet Airways offered the cheapest rates on the route. Without much thoughts, I went ahead and booked a ticket on Jet Airways - after all, this would be an opportunity for me to try the new full-service offering from Jet. 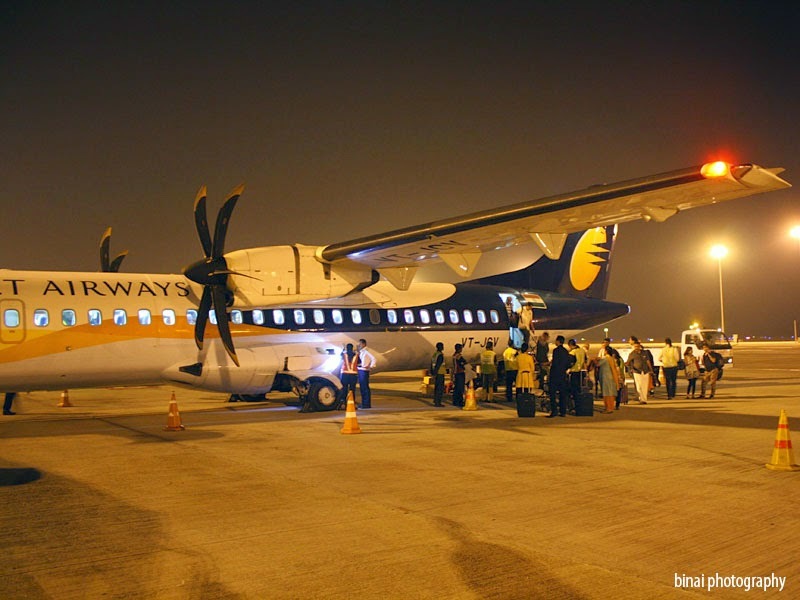 Jet Airways operates 5 services on the Bengaluru-Kochi-Bengaluru sector, all using ATR72s. I was taking a day off on Monday, and hence had the option of picking one of the three evening departures - I chose the one at 1910hrs - the other two are at 1605 and 2225hrs. I've been on the 2225hrs service twice earlier, while the 1605hrs would mean I'd have to leave home soon after lunch. Given my obsession to use public transport as far as possible, I left home after my evening tea, just past 4pm. The nearest bus stop is hardly 300mts away, and headed there to catch the first of four buses that I have to take to reach the airport. The journey to the airport was usual - just that I missed the bus to the airport in the last leg and had to hire an auto-rickshaw. I reached the airport sometime past 1745hrs - with 85 minutes to go for my flight. Entry to the departure terminal was fairly crowded - looked mostly like people heading back after vacations. I noticed that there weren't any passenger carrying a Jet Airways ticket. I decided to click some pics inside the terminal, and use the washroom before checking in. The check-in desk was absolutely empty - just two agents talking to each other. 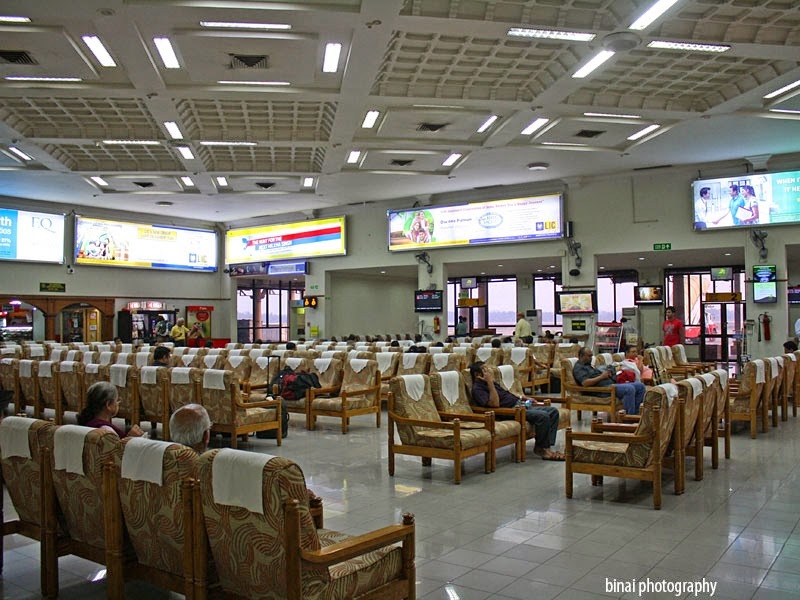 The Domestic Terminal. The baggage screening and check in counters can be seen. There is a layer of security between. 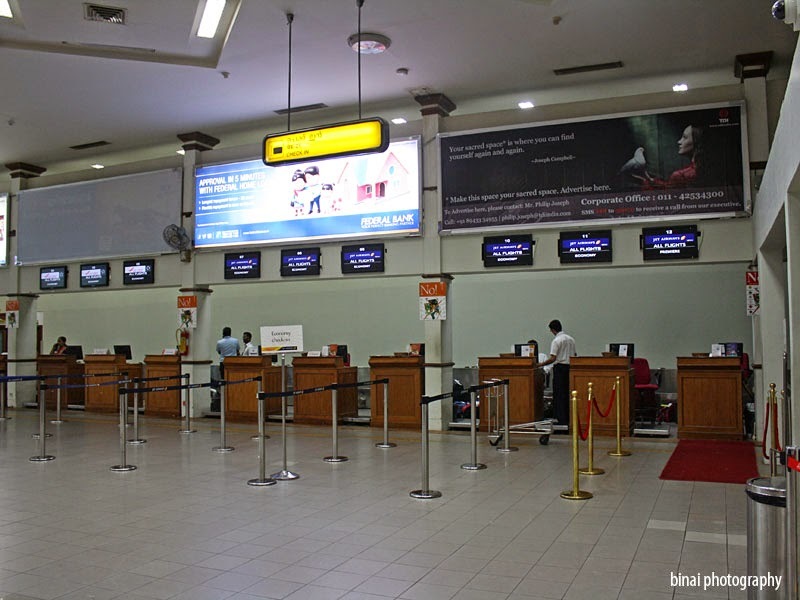 The absolutely deserted Jet Airways check-in counters.. They surely did not mind my intrusion - a quick good evening and a warm smile as the agent welcomed me, and checked me in. He reconfirmed if I had check-in baggage before printing the boarding pass for me. Armed with the boarding pass, I headed for security check. 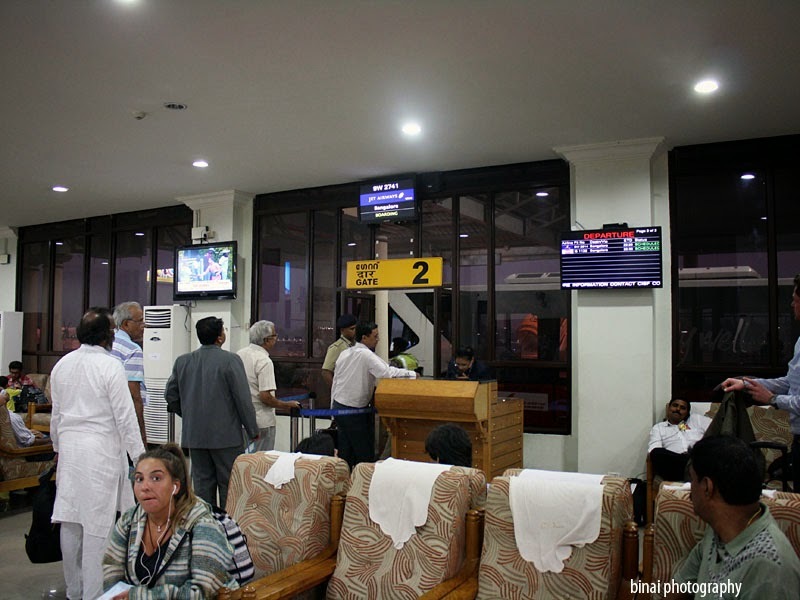 Of late, there is a pre-security screening - a cop stands on the way and checks the boarding pass before letting passengers to the scanning/frisking area. Security check was deserted - as is the norm on most of my journeys - I was past security check in no time. I was in the security hold by 1754hrs - just 9 minutes after reaching the airport!! Security Hold : With the age old wooden Sofas. There was no activity in the terminal at all. The waiting area was more or less empty. I was a bit hungry by now, and decided to try out the small eatery present in the security hold. I picked up a sandwich from there and headed to a seat with a view of the apron. An Air-India flight was expected then, and a gate agent was waiting there for the aircraft to come in. Jet Airways' B738 VT-JBP was resting on the international side of the apron. Sometime around 1805hrs, Air India Regional's VT-ABO (My incoming aircraft) taxi'd into the apron. The AI agent now sprang up from the chair she was resting on, and announced the arrival of the aircraft. They were taking forever to call for boarding - quite unlike what Jet or the LCCs do. While Air India commenced boarding, I saw my aircraft sneaking in behind (1823hrs) - I couldn't see the registration, but was hoping its a new one for me. Sometime around 1827, another Jet Airways B738 came in (VT-JBN). This particular time slot sees a set of International departure for Jet Airways. The Air India ATR42 was pushed off at 1832hrs, and shortly afterwards, boarding for my flight was called. By now, I could see the registration of my aircraft - it was VT-JCV, a new registration for me! 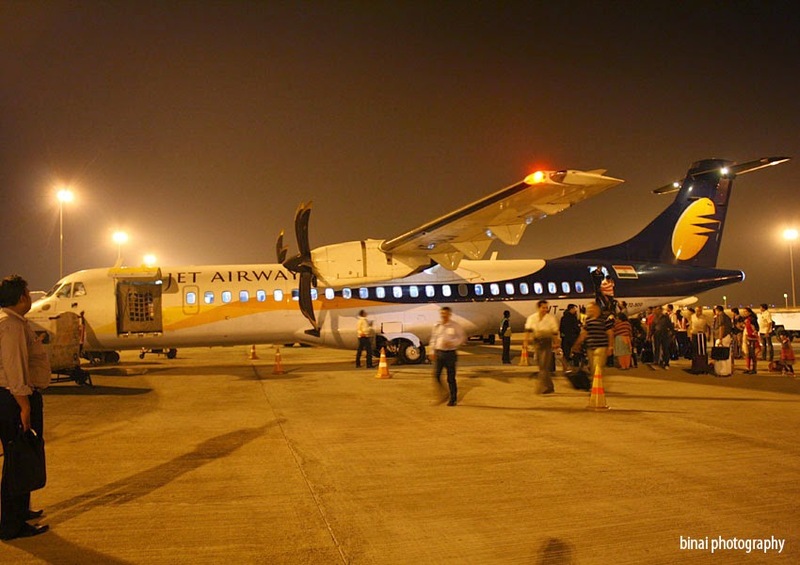 VT-JCV is a 2010 built ATR72-500 (72-212A), which has been flying with Jet Airways since December 2010. Right after the boarding call. The boarding call was made at 1835hrs - and Jet usually calls for a zone wise boarding. It was the same this time as well - passengers on rows 1-9 were called first. But then, we Indians hardly respect such announcements. I decided to stay around till most of the crowd is gone. I joined the queue when the crowd thinned out, and got into the second bus, at 1844hrs. The apron at Kochi is very small, and it hardly takes any time for the bus to reach the aircraft. The first bus hadn't returned when my bus reached there - there was a small queue to get into the aircraft - I was inside by 1851hrs. Flight attendents Shahnaz and Vijayalakshmi were at the door welcoming each guest, and were happily helping passengers with their baggage. The ATR aircraft has a narrow stairway, and passengers with hand-baggage often struggle to get in with their baggage - the cabin crew did a great job helping them. Just before boarding. 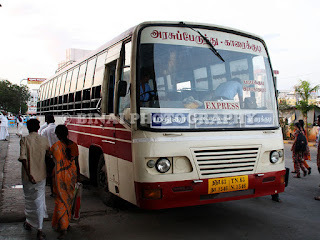 That is VT-JCV for me..
One more bus came after my bus, and boarding was done by 1854hrs. I expected a before time departure and looked forward for the door to be armed. But that did not happen. There were no announcements on what was the delay either. Sometime around 1911hrs, another bus arrives at the aircraft - three passengers and two off-duty crew get in to our aircraft. We were actually waiting for these passengers connecting in from an international flight to come in. Door was finally armed at 1913hrs, and Shahnaz started off a long series of announcements. The routine Welcome to Jet Airways announcements in Hindi and English followed by announcements about Jet being a full service carrier now, and an introduction to JetPrivilege. While the announcements were in progress, the aircraft was pushed back (1914hrs). Capt. Prashant Bhise and Capt. Karan Pratap Singh were at the flight deck. The safety demostrations began soon after push back. We started our long taxi to Rwy27 at 1917hrs. It is a very long taxi and it took us no less than 6 minutes to reach the runway threshold. We had two minutes of waiting before the take-off roll began. We were airborne at 1925hrs - taking off to the west, and then performing two beautiful right banks. The view of Kochi Airport from the air was just mindblowing - I'd have gone shutter happy had it been in the day. After the two turns, we were now headed to the North (northeast to be correct). This was perhaps the most beautiful take-off I've had - I spent most of the time trying to identify the areas I saw below. Coming to the aircraft - JCV was probably the cleanest ATR that I've been in. The interiors looked very young and fresh. The seats were fresh, and interiors spotless. The windows were a bit dirty though. I felt the seats in this particular aircraft from the ones I've been on earlier (all of Jet Airways). The clean aircraft added to the warm service by the cabin crew made this a trip I'd cherish for the days to come. Soon after the seatbelt sign was switched off, the Shahnaz came on the PA and announced that the inflight service would begin shortly. The trolleys appeared soon. 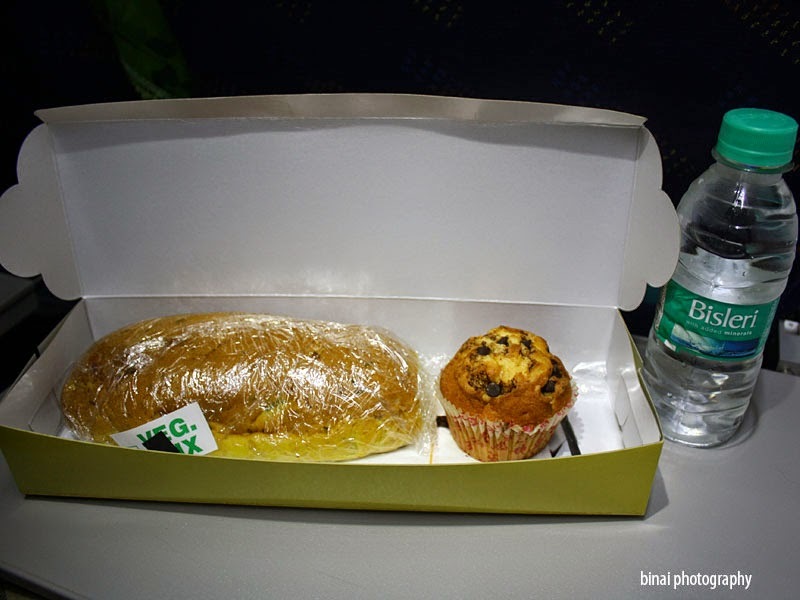 Passengers with special meal requests were served first, and then the regular service began. There were two choices - a Veg and a Chicken. Snacks were served in boxes. I opened my snack box, and found a bread roll and a choco-chip muffin inside. This was accompanied by a 250ml bottle of water, served chilled. The bread roll was soft and had a paneer filling inside. The roll was medium spicy, and the paneer was a bit rubbery - not very bad though. I am not sure if it was only a thought, but the Muffin did not taste eggless. I'd have loved if they served eggless muffins in the Veg snack boxes (not that I mind having egg - but a general thought). 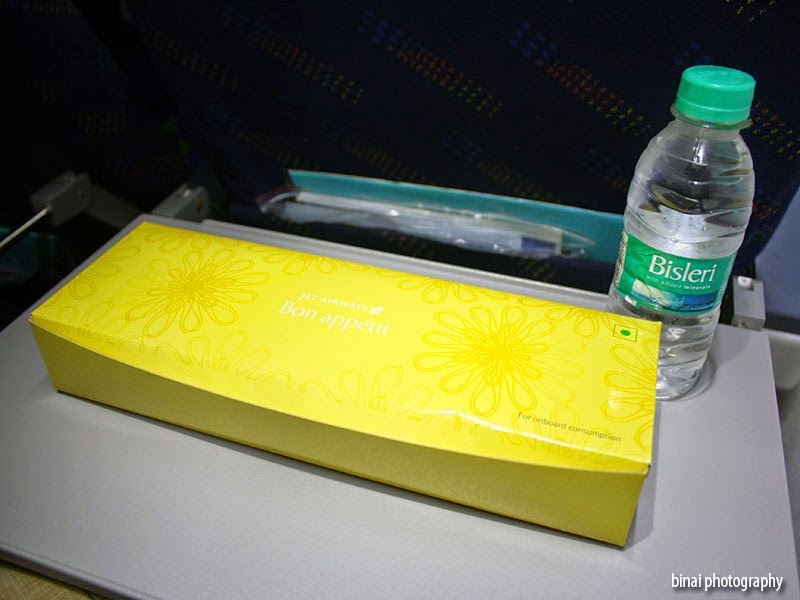 A second serving of water was given on request - infact, the FAs came around with trays containing water bottles and asked all passengers. Sometime around 2000hrs, the FO came on the PA, and detailed about the route we were taking, and said that we were flying at FL170 and we had another 160kms to go to Bangalore. He also introduced the Captain and the cabin crew during his address. Seatbelt signs came on, and the landing announcement was made at 2013hrs. Soon after the announcements, the cabin crew did another round to check for trash and ensured the cabin was prepared for landing. We touched down on Rwy09 of Bengaluru International Airport at 2024hrs. We had another long taxi after landing - we were to park at Stand #37, a fairly remote stand closer to the western end of the apron. We parked at 2030hrs - it took a couple of minutes before deplaning began. Interestingly, all the passengers remained seated till the aircraft parked and the seatbelt signs went off - quite a rarity in India, I must say. 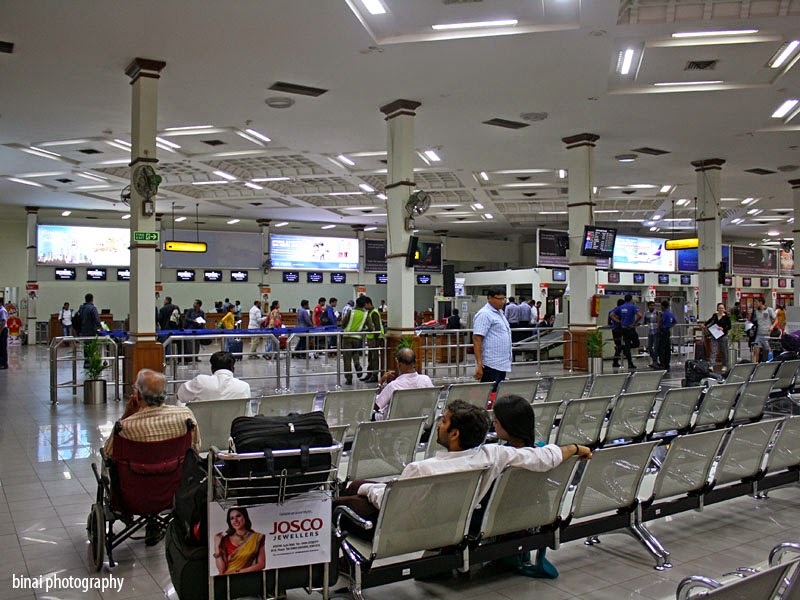 Soon after landing, announcements were made that passengers to Hyderabad should remain seated (The aircraft continues to Hyderabad), while passengers connecting to Pune should contact the ground staff immediately on deplaning. I remained seated for a while, and when the mad queue to get off the aircraft broke, I got off my seat. I was out at 2035hrs. 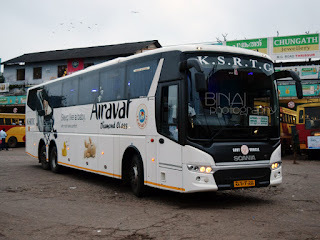 An old rickety tarmac bus took us to the terminal, and I was out of the airport by 2049hrs. Tried getting a full pic, but the gentleman walked in at the last moment.. I must say this - Jet is surely gunning the top spot. I did not find a single reason to whine about (maybe I could whine about the paneer being rubbery or the muffin tasting of egg - but they surely aren't deal breakers). The aircraft was clean, the cabin crew did a great job, were very responsive and I am sure nobody on that flight had reasons to complain. 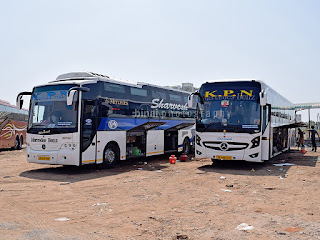 The passengers continuing to Pune were allowed to get off first, and they were immediately ushered into a separate bus. Jet Airways did a great job, right from check-in at Kochi till the time I came out of Bengaluru airport.